John Stossel is a brave defender of libertarian philosophy. 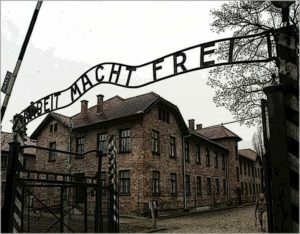 Auschwitz gate sign, work sets you free. I believe the largest inhibitor to freedom and free markets is our public/government school system. Staffed by government employees, it’s only natural for government school teachers to extol the virtues of government while downplaying or outright ignoring the power of freedom and the private sector. Public schools are the root of the problem. As long as our children are indoctrinated with big government ideology and trained to look to government for solutions to societies needs, we will never stem the tide of socialism in the United States. People like Stossel “preach to the choir.” Our government schools have already taught the children that people such as Stossel, Ayn Rand, Fredrich Hayek, and Ron Paul are the “lunatic fringe,” unworthy of serious consideration. They teach that freedom is a lofty, abstract, concept that must be redefined to fit our modern, enlightened society. God bless people like Stossel for “keeping the faith,” for holding out hope that our downward spiral into the abyss of socialism can still be stemmed. The November Presidential election will be nothing less than a referendum for or against freedom and free markets. If Obama wins another term, I’m afraid we’re doomed, not because of what he’ll do if elected but rather because his election will be an indisputable indicator that the majority of voters believe socialism trumps capitalism.